The abandoned monkey who has found love with a pigeon. 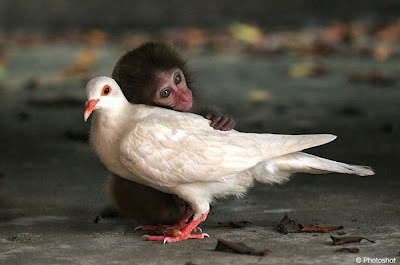 "They're an odd couple in every sense but a monkey and a pigeon have become inseparable at an animal sanctuary in China. The 12-week-old macaque - who was abandoned by his mother - was close to death when it was rescued on Neilingding Island, in Goangdong Province. The blossoming relationship helped to revive the macaque who has developed a new lease of life, say staff at the sanctuary. Now the unlikely duo are never far from each other's side, but they aren't the only ones to strike up an unusual friendship. Earlier this year a pig adopted a tiger cub and raised him along with her piglets because his mother couldn't feed him. " This is great man. Ha, life is wonderful. I am stealing this to post on my blog. It made my day. I love this story!!! These are the kind of stories that need to make it on the evening news.